I received book for review from Candlewick Press. The opinions within this post are of my own and I was not influenced in any way. Please do your own research before purchasing products or using services. Your opinions and results may differ. 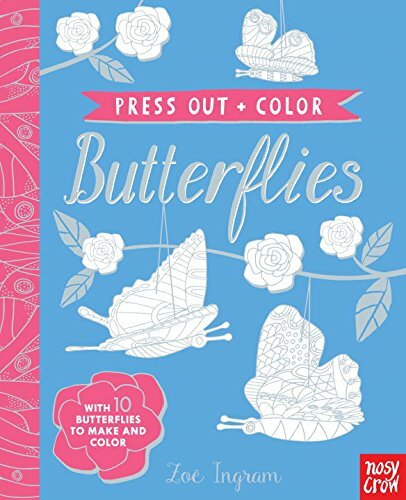 This book of beautiful butterflies is full of press-out designs intricately decorated with foil and perfect for all ages to color in. Featuring ten unique designs, the press-out pieces can be slotted together to create bright and cheerful ornaments. These gorgeous butterflies are perfect to hang around the home and add sparkle to any setting. Illustrator Zoe Ingram has designed ten butterfly species to color and display. 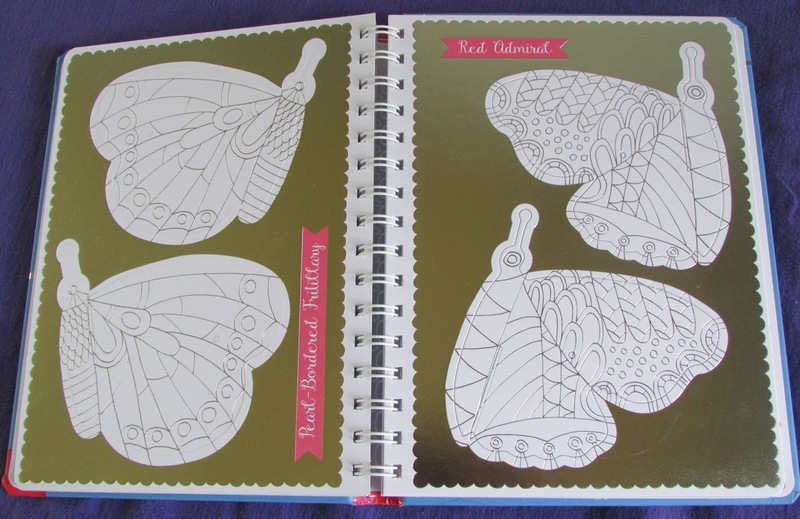 Press Out and Color: Butterflies is a spiral bound book with a hardback cover and features ten species of butterflies. The intricate designs are foil and it's up to you to color the butterflies in with your colors of choice. I found that it's best to use gel pens because colored pencils don't show up very well and markers smear. You will want to make sure one area is dry before going to the next or there is the possibility of smearing. Some of the butterfly species includes are Painted Lady, Blue Morpho, Monarch, and Red Admiral. There are small holes in each butterfly so you can hang your creations after you've colored them and pressed them out of the book. My screened-in back porch is lined with handmade beading and a butterfly charm at the bottom of each. Once I am done coloring all the butterflies in this book, I am going to hang them up in the back porch to go with the rest of my butterfly theme. One person will win Press Out and Color: Butterflies. I like to work in the garden and just take walks when the weather is not so hot. I enjoy gardening and working in the yard. When the weather is cool, I love to take walks around my neighborhood and also do yard work. We like to play in the park, especially when the weather is cooler. I love to be outside, but my favorite outside activity is hiking! We love to play volleyball in the backyard when we have enough people. I love to garden. Can't get enough of it. I also love swimming. Doesn't matter whether its a pool, lake or ocean. I like to playoutside with my kids. Soft ball, chalk drawing, walking, swimming--all of those are fun! I enjoy doing yard work and taking walks through the cemetery with my kids. I love getting outside with my family,whether it's hiking or playing in the park.Courtney Hennagir on rafflecopter. An outdoor activity I enjoy doing? How about two? Dozing and lolling. I could do those for hours! I enjoy walking from the house to the pool. I enjoy going to the lake. I enjoy walking around my neighborhood when it's cooler outside! Just sitting outside in my hammock listening to nature. Hiking with my dog. He has his own backpack and we clean up the trails as we go along. We love to hike outside. I love going out to play disc golf! I enjoy gardening in our yard. we love playing in the sprinkler! We like walking and watching birds. I enjoy hiking mountain trails. I enjoy sitting by my pond and listening to the water flow. I enjoy walking around the lake. I like cross country skiing. I really enjoy camping, or just hanging out by the lake. I like to camp and hike. I like going hiking and gardening. I like geocaching and identifying weeds. I like gardening, swimming and riding our bikes as often as possible. I love swimming in the sea! I really enjoy walking outdoors with my family in the evening. We love going to the beach. The ocean or the local paper pond. We prefer the ocean though. I like gardening and walking on the beach. I love being in my garden just about every morning and night. It's been so hot here so i have to be careful but cooler weather is coming and i can't wait to go camping, hiking, grilling, just being outside. I like to work in the garden. I enjoy hiking and walking. my husband and i really enjoy hiking. I love to swim and hike outdoors. I enjoy taking long walks in our hilly neighborhood with my hubby! I like to walk in the local park. I like to go for strolls thru the woods. Not long strolls, my knees don't last that long, but brief walks are good for the soul. We love to go camping! An outdoor activity that I am currently enjoying is gardening. I love walking out to my garden, collecting food that I have grown and eating it. We love combining hiking with bird watching and journaling. I love to garden and fish. I go for walks in the woods with my granddaughters. Camping at the lake with the grandkids.